Grab a few boxes of Winchester steel shot for your next waterfowl hunting trip. 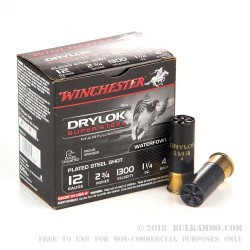 This premium ammunition is specifically optimized for marine environments and includes water-resistant components such as a Drylok steel wad and lacquer-coated primers. 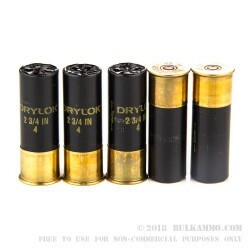 Although it uses a standard 2-3/4" length shell, this ammunition is relatively powerful and fires a 1 1/4 oz. load of #4 shot at a muzzle velocity of about 1,275 feet per second. These shells are made in the US and come in boxes of 25. 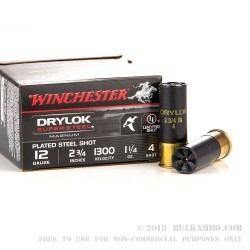 Whether you shoot monthly, weekly, or daily, Bulkammo has everything you need. Choose from a wide selection of self-defense, hunting, and range cartridges from all the top brands.